Growing evidence links inflammation to depression and the combination of antiinflammatory drugs with an antidepressant to treat depressive symptoms is currently suggested. There are only few studies concerning the molecular mechanism underlying this comorbidity, and many of them point out the importance of the tryptophan pathway. There is yet no data that analyzes the structural similarity of the molecules used for the treatment of these comorbid diseases. This review aimed first to classify current antidepressant drugs and Non-steroidal Anti-inflammatory Drugs (NSAIDs) according to their structure. Molecules with two aromatic rings linked with a heteroatom or a carbonyl group (vortioxetine, ketoprofen, diclofenac), or presenting a naphtyl moiety in their structure (duloxetine, agomelatine, naproxen, nabumetone) were found to be structurally related. The antidepressant activity of these NSAIDs and the anti-inflammatory activity of these antidepressants were investigated. The literature search interestingly revealed reports indicating a serotonin-related antidepressant activity of the NSAIDs for structures found to be structurally similar to some antidepressants. Similarly, the antiinflammatory activity of the corresponding antidepressants was found to be correlated to the tryptophan metabolism pathway. These findings suggest a common molecular mechanism involved in both of the diseases and exhibit the importance of the molecular structure for a drug to be a potent antidepressant and/or anti-inflammatory agent. Keywords: Antidepressant, Non-steroidal anti-inflammatory drug, Cytokine, Chemical structure, Tryptophan, Comorbid diseases. Keywords:Antidepressant, Non-steroidal anti-inflammatory drug, Cytokine, Chemical structure, Tryptophan, Comorbid diseases. Abstract:Growing evidence links inflammation to depression and the combination of antiinflammatory drugs with an antidepressant to treat depressive symptoms is currently suggested. There are only few studies concerning the molecular mechanism underlying this comorbidity, and many of them point out the importance of the tryptophan pathway. There is yet no data that analyzes the structural similarity of the molecules used for the treatment of these comorbid diseases. 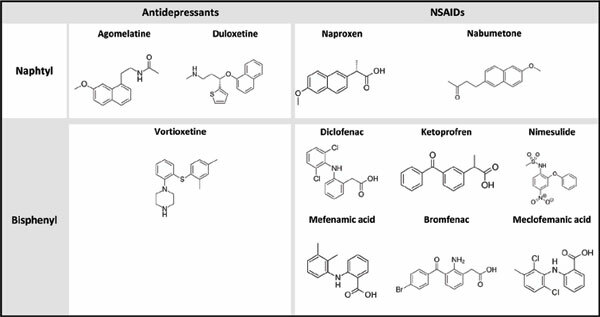 This review aimed first to classify current antidepressant drugs and Non-steroidal Anti-inflammatory Drugs (NSAIDs) according to their structure. Molecules with two aromatic rings linked with a heteroatom or a carbonyl group (vortioxetine, ketoprofen, diclofenac), or presenting a naphtyl moiety in their structure (duloxetine, agomelatine, naproxen, nabumetone) were found to be structurally related. The antidepressant activity of these NSAIDs and the anti-inflammatory activity of these antidepressants were investigated. The literature search interestingly revealed reports indicating a serotonin-related antidepressant activity of the NSAIDs for structures found to be structurally similar to some antidepressants. Similarly, the antiinflammatory activity of the corresponding antidepressants was found to be correlated to the tryptophan metabolism pathway. These findings suggest a common molecular mechanism involved in both of the diseases and exhibit the importance of the molecular structure for a drug to be a potent antidepressant and/or anti-inflammatory agent.